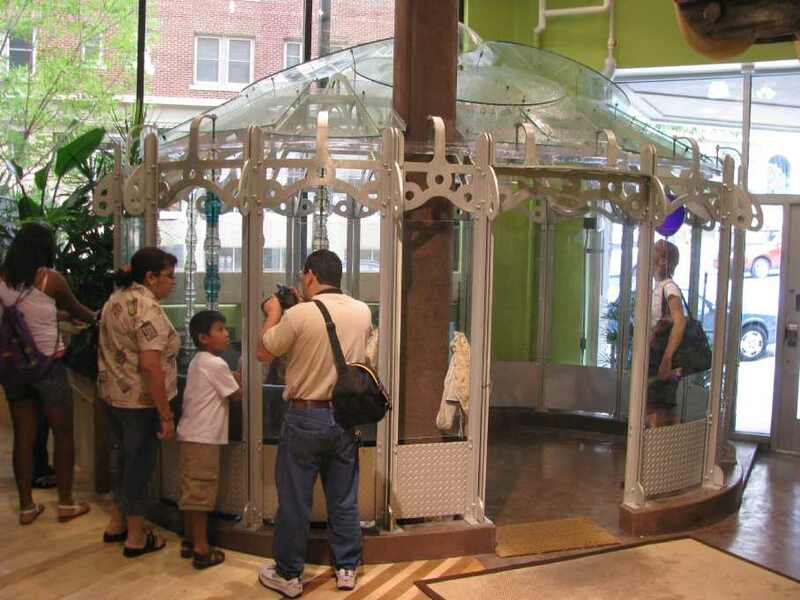 Design Coalition architects collaborated with Tom Lindsay create two major water exhibits for the Madison Children's Museum: the Water Machine and the Water Dome. 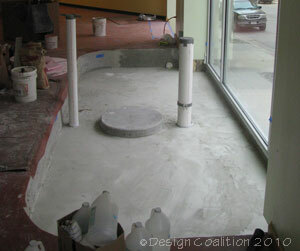 The high-profile Water Machine is placed in the entrance lobby because an existing recess in the floor -- originally for sidewalk window displays -- perfectly accommodated the drain basin depth. The laminar jets and the spinning vortex of water create an irresistible attraction, from inside as well as outside the museum. In the video (below) Tom explains some of the operation to Museum staffers. (above) Early design concept for the Water Machine enclosure and ball rails. (above) 3-D renderings of the final design. 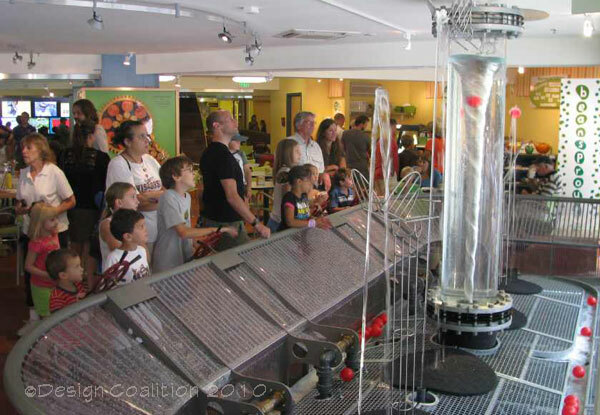 The "Captain Nemo" railing shape directs errant balls to mesh ball-control surfaces; children use the ship's wheel-stanchions to throttle the flow through laminar jets and attempt to guide the balls over the glide-rails and into the water vortex. 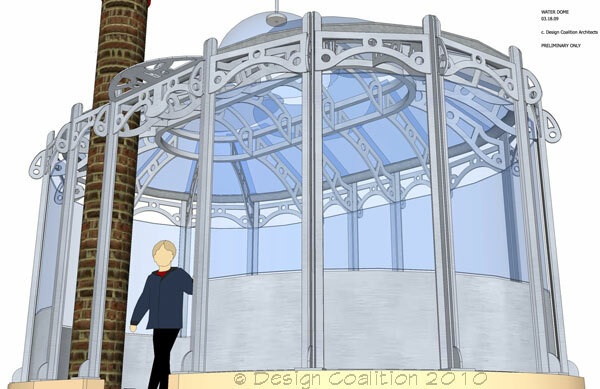 A castleated Victorian-esque glass house crafted of CNC-cut structural aluminum and recycled glass. Stand in the center and you are directly under a dome of transparent flowing water. (above) 3-D rendering of the Water Dome. 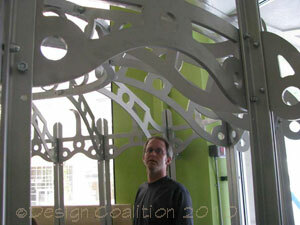 (left) Roger inspects the installation. The radius of the Water Dome's curved walls were designed to re-use the glass enclosure from the original building's circular stair. 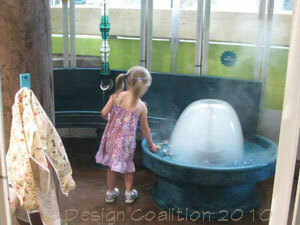 Children experiment with mist and water inside the Water Dome. Water cascades from the glass roof down over 'rain chains' made from old glass electrical insulators into play basins. The central feature is a Mist Bell -- flowing water filled with ultrasonically-created mist.